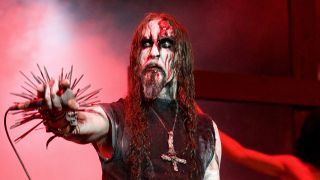 Having played his last shows as God Seed last September, former Gorgoroth vocalist and all-round cult figure Gaahl is to announce his new band, Gaahls Wyrd, and their debut show at November’s Blekkmetal festival that takes place at the USF Verftet venue in Bergen, Norway on November 13-15. A one-off, non-profit festival that’s both a tribute to True Norwegian Black Metal and a tattoo convention featuring 19 world-class and metal-steeped inkers, Blekkmetal is the brainchild of one of the most respected artists in the extreme metal world, Jannicke Wiese-Hansen, whose work has graced Burzum’s best known album sleeves, Satyricon’s first album and created the logos for both Immortal and Enslaved. Although the band’s lineup is being kept under wraps for now, Gaahls Wyrd joins a bill that already includes Enslaved, Taake, Aeternus, Helheim, Kampfar, Hades Almighty and Gehenna. Although the band are working on new tracks, their debut show will be in keeping with the theme of the festival. Was the festival’s focus on the roots of Norwegian black metal one of the main reasons for making this the band’s live debut? “Yes, absolutely,” he affirms. “I had been asked if I wanted to perform with Trelldom, and I said that Trelldom was not supposed to be played live, even though the music would be excellent live, I think. Basically it was done live in the studio, but not everything needs to be presented in a public universe. But I told them, I have another idea that, if you’re interested, I can maybe get this to work. I didn’t have to think too much about it because of the one asking, and good people need rewards, heheh! It was fairly easy to say yes, and then the opportunity to reveal the band as well was a bonus for both parties. Gaahl has had a love-hate relationship with playing live in the past, and he’s no longer a part of the live setup of Wardruna. Can he see Gaahls Wyrd rekindling his desire to play live? For latest announcements from Blekkmetal, tickets, and the full program, including the full list of tattoo artists, film screenings and discussions, check out the festival Facebook page here, and the official website here!